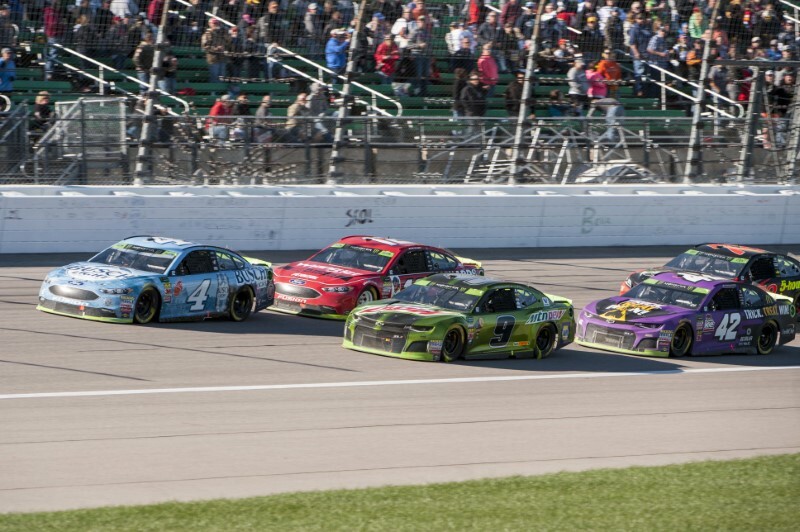 KANSAS CITY, Kan. – With a handful of laps left in a pitched battle between Chase Elliott and Kyle Busch, Kyle Larson joined the party. 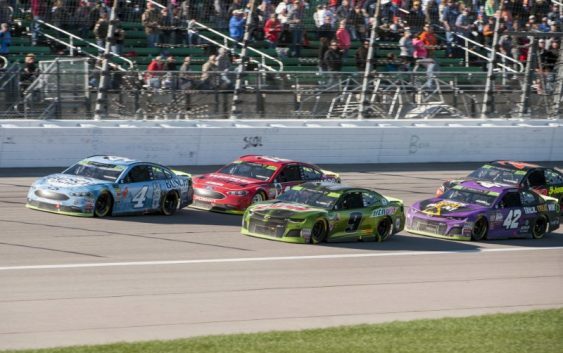 Larson needed a victory Sunday in the Hollywood Casino 400 at Kansas Speedway to advance to the Round of 8 in the Monster Energy NASCAR Cup Series playoffs. Late in the race, he began making dramatic gains on Busch, who was running second, and Elliott, who held the lead. Larson, however, stalled out in third place and saw his chance for a championship end two positions short at the finish of a remarkable weekend for the No. 42 Chip Ganassi Racing team. Larson wrecked his primary car on Friday two laps into the opening practice and qualified 27th in a backup. Because of the change to the backup car, he had to abandon his starting position and drop to the rear at the start of the race Sunday. Below the playoff cut line entering the Sunday race, Ryan Blaney made a concerted run toward advancing to the Round of 8. “Obviously, it was a mistake I made trying to work hard to catch those guys (Kevin Harvick and Elliott), and I pushed too hard and got in the fence,” Blaney said. “It’s all my fault. Whether it would have worked out for us or not, I don’t know. Brad Keselowski desperately needed a caution in a race that produced only three — for two stage finishes and a blown engine. Knowing Keselowski didn’t have the speed in his No. 2 Team Penske Ford to win the Hollywood Casino 400 heads-up, crew chief Paul Wolfe kept Keselowski on the track until the end of two successive fuel runs, hoping to catch a caution and leap-frog the cars that had already stopped. But the caution never came, and Keselowski’s eventual sixth-place finish wasn’t enough to earn a berth in the Round of 8 of the playoffs. “I would say about the end of that first stage it was pretty obvious that we needed something, after I saw some things on the other cars,” Keselowski said. “We needed something to step up, but it just wasn’t there. We just weren’t as good today as we were (Saturday in practice), and I’m not sure why. Everyone else seemed to find a little from practice and we were about the same, maybe a little worse than we were in practice. With the four finalists for the prestigious Betty Jane France Award Humanitarian Award announced on Sunday at Kansas Speedway, voting is now open to choose the winner of a $100,000 grant toward a creative and important children’s cause. *Carl Dakes of Harwood, Md., an 18-year volunteer representing the Believe In Tomorrow Children’s Foundation, Inc., of Catonsville, Md. The foundation provides hospital and respite housing services to critically ill children and their families. *Sarah Kersey of Dublin, Ohio, a cancer survivor who represents Flying Horse Farms in Mt. Gilead, Ohio. The facility, where Kersey has served as a volunteer since 2010, provides transformative camp experiences for children with serious illnesses, at no cost. *Cliff Preston of Gainesville, Fla, representing UF Health Shands. He has volunteered for more than 25 years as a “cuddler” to soothe hospitalized newborns in the NICU during a parent’s absence. *Rex Reynolds of Hazel Green, Ala., representing the Boys & Girls Clubs of North Alabama. A former Huntsville, Ala., police chief, Reynolds grew up participating in club programs and has now served in a volunteer role for 13 years. “The Betty Jane France Humanitarian Award was named after my late mother, Betty Jane France,” International Speedway Corp. CEO and vice chairperson of the board Lesa France Kennedy said during the introduction of the finalists. “She founded the NASCAR Foundation back in 2006. NASCAR vice chairman Mike Helton sees the award as an appropriate memorial to its namesake. “Betty Jane is the heart and soul of the human factor in the NASCAR community,” Helton said. “Always was. Even before there was a NASCAR Foundation, Betty Jane would show us, tell us, teach us, ask us to remember your community, remember people who you can help, not just our fans but anybody that they touch. The award winner will be determined via an online fan vote through Nov. 19 at 5 p.m. ET at NASCARfoundation.org/Award. The winner will be announced on Nov. 29 during the Monster Energy NASCAR Cup Series Awards at Wynn Las Vegas. The NASCAR Foundation will donate $25,000 to the charities represented by the award finalists, with the winner’s charity receiving a $100,000 donation. –By Reid Spencer, NASCAR Wire Service. Special to Field Level Media.